The Scubapro K5 Knife is ready for any situation. The 11cm blade is substantial enough to give you enough heft to get the job done without being unwieldy. A serrated edge on the lower half of the blade allows for sawing while a line cutter can help you get out of difficult situations. The blade is made of high quality stainless steel meaning it'll remain corrosion free for years to come. An ergonomic grip makes for comfortable and safe use while a locking system on the sheath ensures the blade never comes loose when you don't want it to but remains effortless to remove when you need it. Corrosion Resistant Blade - A high quality stainless steel blade ensures the K5 Knife will resist corrosion from underwater use for years to come. 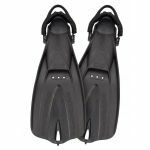 Balanced Blade Length - Scubapro have designed the 11cm K5 blade to strike a manageable balance between longer, harder to control blades and smaller less powerful ones. It's easy to use and thoroughly capable. Line Cutter - The K5 features a line cutter notch to help you swiftly hook and cut through line, helping free you in moments. Serrated Edge - The serrated edge allows you to saw through tough materials. Ergonomic Grip - Safely and comfortably control the K5 with it ergonomically designed grip, even when wearing gloves. Sturdy Moulded Sheath - The Scubapro K5 comes with a sturdy sheath ideal for protecting your knife and ensuring your don't cut yourself when not in use. Unique Locking System - The K5's sheath uses a simple locking system to ensure that your knife stays locked in the sheath when not needed. The simple unlocking mechanism can be used easily with the same hand you draw the knife with for single handed operation. Easy to Adjust - Two quick buckle straps allow for quick adjustment of the K5 on your calf, thigh or forearm. 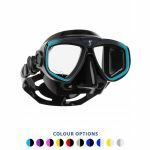 Who is Scubapro K5 Dive Knife for? The Scubapro K5 is a feature packed knife made from high quality corrosion resistant materials. Any diver looking for a do-it-all knife to keep them safe and last for years to come will find the K5 an excellent mid range tool worth taking on their next adventure in any environment.